Bilingual: Stella and Olivia Pratt have a “chat” during their break from classes at Trinity College. EVERY day when Stella Pratt enters Trinity College, Beenleigh, it’s a whole new world for the Year 11 student. At home Stella speaks Auslan, or sign language, with her family and younger sister, Olivia. Both her parents are deaf, along with her maternal grandparents and the majority of her aunts and uncles. However, Stella and Olivia, who started in Year 7 at Trinity College this year, both have great hearing. Stella said being a Children of a Deaf Adult meant having two hearts – one for each world she lived in, the hearing and the deaf. “My outlook on life is, I think, unique, always trying to make sure each world understands the other and that there are no miscommunications,” she said. When she first arrived at Trinity College, Stella received help with her English language proficiency through the college’s English as a Second Language classes. Stella, who is part of Trinity College’s Year 11 and Year 7 Peer Support program, said at the time there were a number of other CODAs in her grade. “The college put all of us into the same core class, and this helped us to embrace our culture,” she said. Stella said both her parents lived their lives as empowered deaf people, not being afraid of what other people said or thought and always taking pride in the richness of the deaf culture. She said they never felt uncomfortable or out of place when they visited the college. “They are treated the same way all of the other parents are treated,” she said. “At parent-teacher interviews, all my teachers always knew how to communicate with my parents using the interpreters provided. Stella said she considered English as her second language. “I learnt Auslan before I could speak,” she said. “(I) started using both languages when I was about two years old. Stella said her parents raised both sisters to embrace the deaf culture. She said the deaf culture was so unique, she and her sister were constantly learning. “We are both very culturally grounded and have lots of respect for people included in other cultures,” she said. “I have learned how to be sensitive and understanding towards other people, including other people from different cultures. She said knowing both Auslan and English gave a lot of hearing CODAs another dimension of language to use. “Because I am bilingual, I have two sets of vocabulary and my brain is constantly multitasking two languages,” she said. 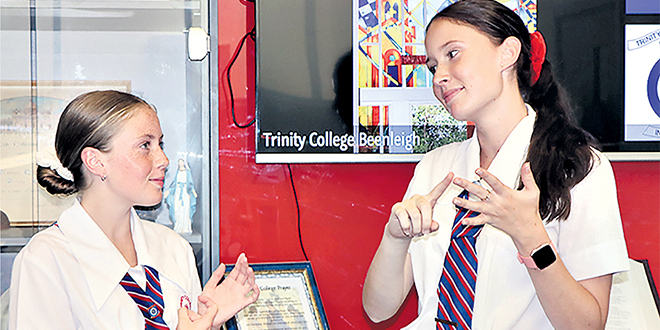 For now, the talented 16-year-old continues her study in a bid to attain a Certificate IV in Auslan this year while studying a Diploma of Business and a Cert IV in Christian Ministry and Theology. She has plans to go to university to study business or marketing and aims to get an interpreters’ qualification after she finished high school.